“I just want to see some Crayons.” This student’s face lit up as they entered the Campus Gate Art Gallery. A bright yellow Penske moving truck sat outside the building late last week. It has been traveling all over the East coast, and its latest destination, Young Harris College, has waited in anticipation to discover what marvels created by medium artist Herb Williams, lie within. Williams’ works are far from ordinary and boring. 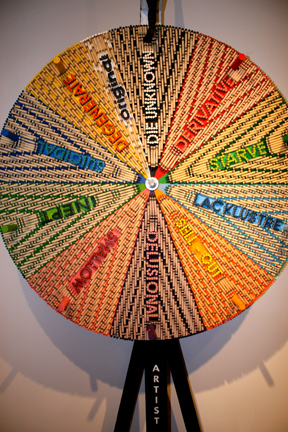 He expressed his reasoning behind the medium he chooses to convey his artistic voice. Williams does not use clay, stone, glass or ice to express his need to create beautiful sculptures. He uses a child’s simple art supply, crayons. Hundreds of thousands of Crayola crayons transform into brilliant pieces of art. Other subjects that inspired the works displayed were environmental depletion, an artist’s biggest fears, love and social networking. Not only were the colors and medium original but, the story told and the images portrayed were creative as well. The crowd ranged from students, children, locals and retired staff. Skye Butler, an art major, felt as though it was unique and very exciting. Williams’ works are so unique and amazing that he is one of the only people to hold an account with Crayola. Williams received his B.F.A in sculpture from Birmingham-Southern College, but discovered his passion for the Crayola wax coloring -pieces 10 years ago. Since then, he has received The Joan Mitchell Foundation Museum Purchase Grant in 2004 and the Next Star Artist Award in 2008. His works can be found in places such as America, China, England, Canada, Belgium, Germany, Australia, Croatia and Japan. His work will be on display at YHC’s Campus Gate Gallery through Friday, February 25. On Thurs. Nov. 4, Young Harris College’s Campus Gate Art Gallery opened the new exhibit “Integrate,” by Darius and Bethanne Hill. 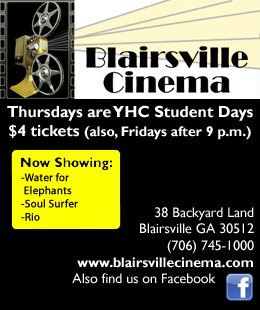 Open to both students and locals, the show began at 6 p.m. Slowly, a mass of students, faculty, staff and community residents began to fill the art gallery. Both Hills gave an introduction to their respective halves of the exhibit, then continued to socialize and answer any questions asked by viewers. One audience member asked Mr. Hill why the image of a hair pick was such an important object in his pieces. Darius replied that earlier in his artwork the picks were a symbol of his African American heritage, because he grew his hair in the time’s fashionable “afro.” The hairstyle was kept in style by using a hair pick. After this, Hill continued incorporating the picks into his work; but, after talking with relatives he realized “the symbolism changed as I learned more about my heritage and myself, and it is an ever changing object, where they actually start resembling people; and, so many different speculations can be made.” The majority of Darius’ works are large scale mixed-media prints, with interspersed small scale paper canvases with his running theme of African American heritage and memorabilia. To segue into his wife Bethanne Hill’s work, there were a series of small canvas paintings of tombstones stylistically similar to Darius Hills’, but her style is more influenced by Aboriginal and tribal artworks. For her inspiration, she draws on the folk music of her rural Alabama beginnings. Bethanne Hill is a full-time artist with a Bachelor’s degree of Fine Arts from Birmingham-Southern College, and Darius Hill has Bachelor’s of Fine Arts in printmaking from Atlanta College of Art. Currently, Darius Hill serves as the Chair of Visual Arts Department at the Alabama School of Fine Arts. For those that were unable to attend opening night, the ‘Integrate,’ exhibition will be on display until Dec. 3. Britney Carroll’s exhibit, The Exposing Stitch, will be on display at Young Harris College’s Campus Gate Art Gallery until October 29. The opening night exhibition occurred last Thursday, September 30 and garnered a notable amount of attention from the student body. The Exposing Stitch is aimed at pushing social boundaries regarding pregnancy and exposing unspoken fears on the subject. She hopes to help break down social barriers with dynamic interaction between her artwork and her audience. The artwork mostly consisted of aprons, which are typically used to conceal and protect the wearer’s body. 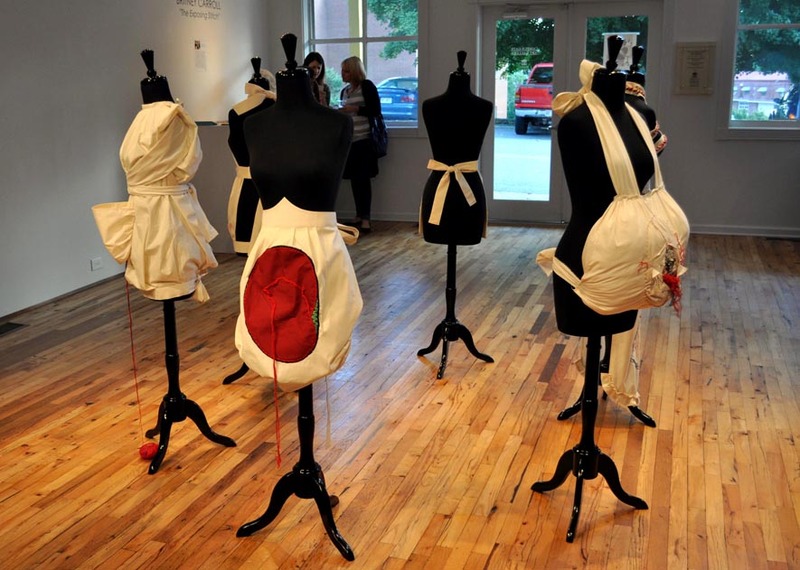 On these aprons, Carroll had sewn imagery relating to pregnancy and the female reproductive cycle, revealing what could be underneath and inside of such an instrument of concealment. Each piece had a muslin base, giving every single one of the artworks meaning before the first stitch. Carroll mentioned that muslin, while a cheap fabric and good for beginners, was really chosen because after further research, she discovered that muslin is the cloth of choice with dress-makers. Dress-makers tend to use it in making dresses before cutting into the more expensive, finer cloths. “So, I kind of think of these as my skin and—testing these things out,” Carroll said. Further compounding her metaphor, she compares the artistic process and the monotonous work of embroidering her artwork onto the cloth to that of pregnancy. Carroll’s exhibit brings the artist back to her roots. Carroll graduated from YHC with an Associate’s degree in 2004. She later graduated from Georgia College and State University in 2007 with her Bachelor’s degree. She also earned her Master’s of Fine Arts from Western Carolina University in 2009.